If São Paulo’s 1900 Pizzeria represents an elegant, refined pizza experience, Café Deskolado represents the quick, fast and cheap end of the scale, with its yellow plastic tables and menu written on poster board. Deskolado spills out into the street right outside the Shopping Barra mall, and most people prefer to mingle over their pizzas with gigantic bottles of Skol beer, while the latest futebol game is fed by satellite to the TV. The word “Descolado,” by the way, means something like “cool” in Brazilian Portuguese. The punny “Skol” in the name has been altered due to the fact that it is a Skol bar, an uber-popular Brazilian beer brand that makes itself known with a huge array of yellow and red branded merchandise. Pizzas at Deskolado start at about R$13 for a large (about US $7) and R$16 (about $9) for a special large. This, as you may recall is a far cry from the US $25+ prices at fancy establishments, so this was a good place to soothe our sticker shock. Even at this lower price point, we were still spoiled for choice. The toppings at Brazilian pizza restaurants tend to be rather more eclectic (as we saw at Fogo 2 Go) than the typical American take out joint, and offerings at Deskolado including toppings of ham, Catupiry cheese, hard-boiled eggs, anchovies, etc. Our classic pick was the chicken and Catupiry pizza – a white pizza that was laden with both Mozzarella and Catupiry cheeses, as well as onions. The pizzas at Deskolado arrive quickly, on a tasty thin crust, perfectly crisp. It may not be an elegant, artisan pie, but it sure is tasty. Above all, Deskolado is definitely is a great place to hang out with friends and enjoy a heated Esporte Clube Bahia match. It was a rare night that we didn’t see the dining area of bright-yellow Skol-branded tables completely full. The pizza is good, but won’t blow your mind, and the addition of friends, futebol and drinks obviously account for some of this place’s appeal. Due to its location and good selection, Deskolado definitely became a staple for when we were craving some take-out food at night in Salvador. However, we would have to go elsewhere for our lunch cravings. 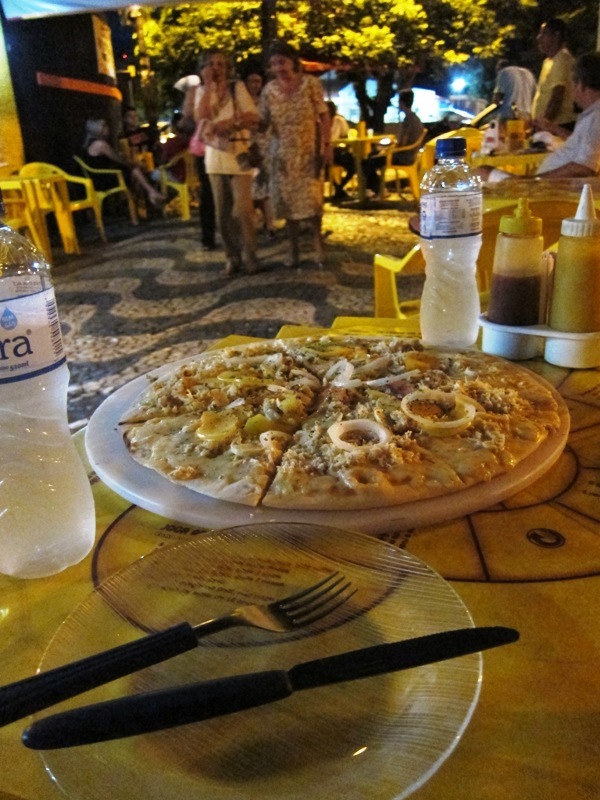 No matter how much you may want a quick slice over lunch– pizza is for dinner only in Brazil!